Israeli forces marked the beginning of the olive harvest season by forcing Palestinian farmers from their lands in Tell. 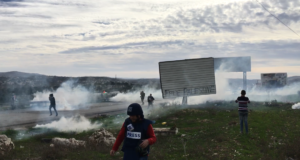 On Sunday 5th October, approximately twenty farmers attempted to harvest olives from their lands adjacent to the notoriously violent Israeli settlement of Harvat Gilad. Whilst the Palestinian olive harvest does not officially begin until 10th October, farmers from Tell, a village near Nablus, felt compelled to start harvesting their olives early, due to the fact that settlers stole all olives from nearby lands the previous year. Farmers were able to harvest for only two hours, under the watchful eye of Gilad’s “hilltop youth”, before Israeli police arrived, questioning farmers and ordering them to cease their harvesting and leave their lands immediately. Aware of the illegality of this instruction, international activists accompanying the farmers called the Nablus District Co-ordination Office (DCO), to inform the office of the breach in law. After explaining the situation twice to the officer in the DCO, the officer refused to take any action by saying “I don’t understand and I don’t care”, before hanging up. Israeli soldiers then arrived to the olive groves, and also ordered the farmers and internationals to leave, advising that they had implemented a “closed military zone” – a territorial closure of a specific area in response to a “threat of terror”. The use of a “closed military zone” in such a situation, where there was no apparent threat to the security of settlers or Israeli forces, constitutes a clear violation of the laws governing its implementation. To force farmers to abandon their harvest also violates the laws governing the use of a “closed military zone”, as the High Court ruling from 2006 obliges Israeli forces to allow Palestinian farmers the opportunity to complete all necessary agricultural work on their land “up to the last olive”. The Israeli soldiers refused to show the maps that demarcated the “closed military zone” (a legal requirement of its implementation) until all farmers and activists had evacuated the area. 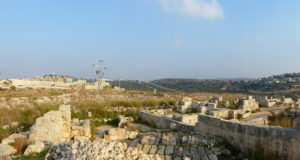 Once on the nearby road, the unit commander produced a map with a red circle marked sloppily around the whole area – a further violation of the Israeli law that states that the area subject to closure must not exceed the minimal amount of territory that is necessary to provide effective protection to the Israeli residents. 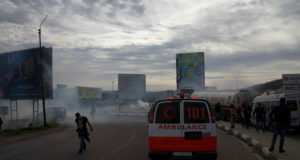 a small area nearby to the settlement, although farmers and activists were evicted from lands more than 500 metres from Harvat Gilad. Throughout the eviction process, Israeli soldiers referred to dates that the DCO had issued in which to offer protection to the farmers as times in which the farmers would be “allowed” to harvest on their lands. This is a reflection of the increasing trend amongst the Israeli forces to transform their legal obligation to protect Palestinian farmers into a permit system – thereby creating a practice whereby Palestinians are systematically denied free access to their lands.